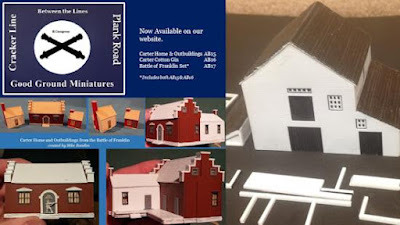 AB15 – The Carter Home and Outbuildings are a set of three which includes the home, kitchen, and farm office. The price is $19.00 USD. AB16 – The Carter Cotton Gin is priced at $17.00 USD. AB17 – The Battle of Franklin set includes both the above, and is priced at $35.00 USD. Both the Home and Gin have some smaller resin parts which require some minor clean-up and assembly before painting. Superglue works fine for this. The castings of these four structures are lovely, in fact, beautiful. The Carter Home and Outbuildings were designed by Mike Randles and the Gin by Paul Bernardino. Casting, as always, was done by John Mayer. They are now available for sale on our website under the Between the Lines link on the left navigation bar.